Aphis lamiorum cause downward leaf-curl on the shoot apices of dead-nettles (Lamium spp. ), and dense colonies may also cause distortion and yellow blotching of the leaves (see first picture below). The adult apterae are dark blue-green to green, usually paler green on the posterior dorsum, and not wax covered, although there may be traces of wax on the dorsal cuticle (see second picture below). The antennal terminal process is 1.8-3.2 times the length of the base of antennal segment VI. The fused apical rostral segment (RIV+V) is 1.20-1.43 times the length of the second hind tarsal segment (HTII). The abdominal dorsum is membranous, with no sclerotic bands on tergites I-VI, but sometimes with small postsiphuncular sclerites. There are 0-5 marginal tubercles on abdominal tergites II-VI, with a mean of 1.4 (cf. 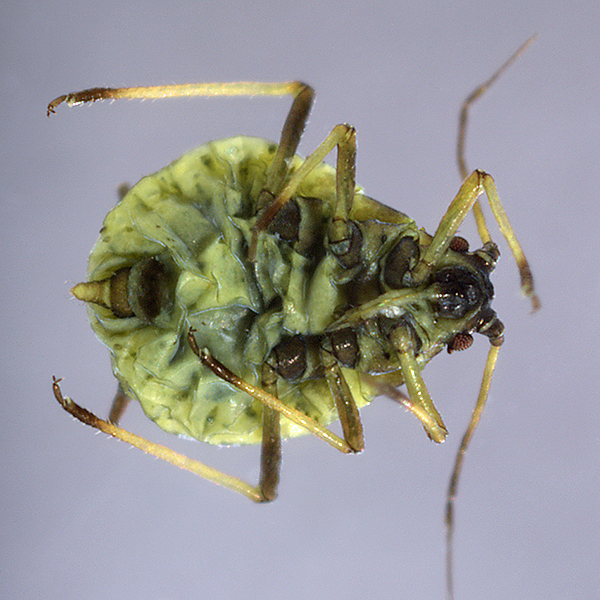 Aphis frangulae which has 0-3 marginal tubercles on those tergites, usually 0). The siphunculi are dark and are 1.67-1.95 the length of the cauda. The body length of the adult aptera is 1.6-2.2 mm. Aphis lamiorum is a member of the Aphis frangulae complex, and difficult to distinguish from other members except by biology and host plant. Specimens can only be accepted as authentic Aphis lamiorum (as opposed to Aphis frangulae beccabungae on its secondary host) if leaf curl is present, and if samples are found early in the year (both were true with our specimens), or contain fundatrices or sexuales. The Aphis lamiorum alate (see third picture above) has a blue-green abdomen with rather large marginal and postsiphuncular sclerites. There are fragmented bands on abdominal tergites I & II, a squarish sclerite on tergite VI and short bars on the posterior tergites. Secondary rhinaria are distributed 6-19 on antennal segment III, and 0-7 on antennal segment IV. As expected, the alate resembles the Aphis frangulae alate. The micrographs below show an adult aptera dorsal & ventral, and an alate dorsal, all in alcohol. The various abdominal sclerites on the alate are clearly visible in the third micrograph below. Heie (1986) accepted Aphis lamiorum as a good species, but did not cover it in his account of the tribe Aphidini. Cocuzza & Cavalieri (2014) concluded that Aphis lamiorum (and two other Aphis species) should be regarded as synonymous with Aphis frangulae. Blackman however, noted that the molecular results did not take account of the different life cycles of the species, and that further molecular work was needed using different molecular markers. 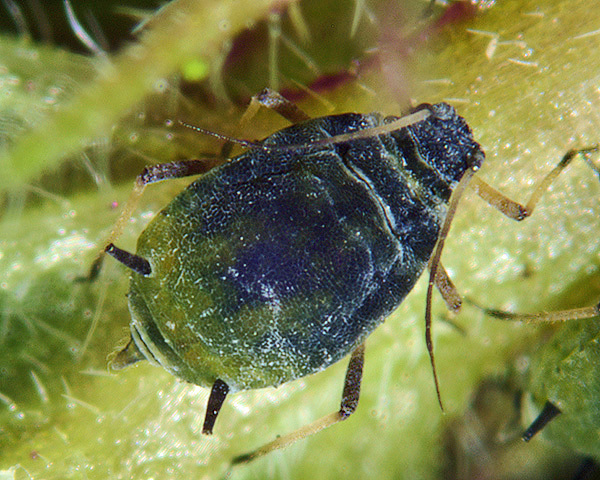 Aphis lamiorum does not alternate, but remains year-round on dead-nettles (Lamium) species. 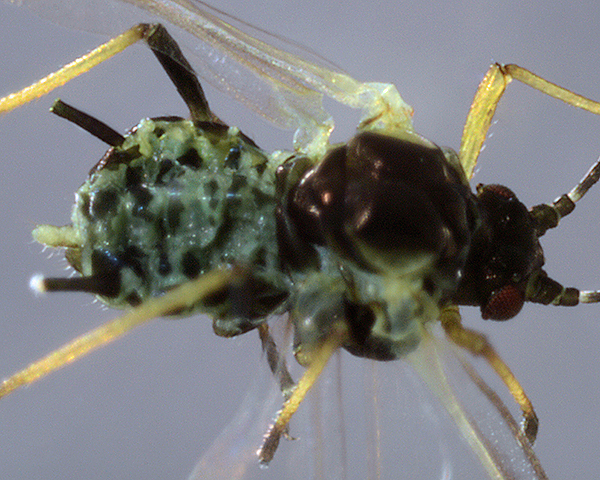 Sexual forms, with an apterous male, have been found in Britain during August. The species has been recorded widely in Europe, albeit some records may be of the host-alternating Aphis frangulae beccabungae on their summer host. 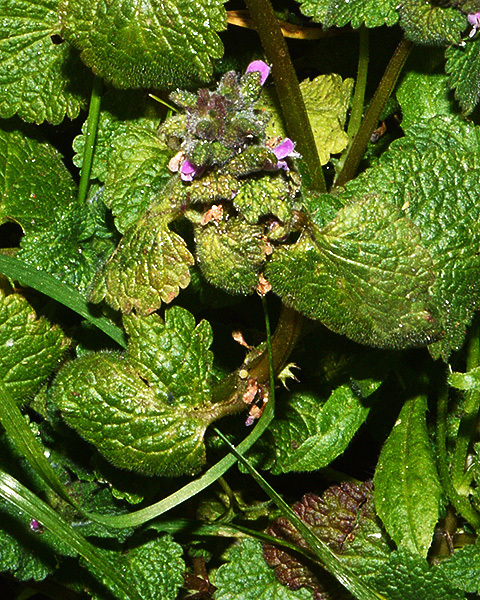 We found Aphis lamiorum in February on several red dead nettle plants (Lamium purpureum) growing between pavement and wall in an East Sussex village. One of the more severely affected plants with curling, distortion and yellowing of the leaves in shown in the picture below. The pseudogall was described by Borner (1950) as a 'loose leaf nest formation'. Stroyan (1955) accepted a colony found by Eastop on 11th May as Aphis lamiorum on the basis that the date did not permit of such large colonies being the progeny of spring migrants. Whilst ongoing global warming would render such assumptions questionable at present, it does indeed seem unlikely that the large colonies we found in February could be the offspring of spring migrants of Aphis frangulae. In this case the clear evidence of galling suggests that this is most likely a case of parthenogenetic overwintering of the monoecious Aphis lamiorum. 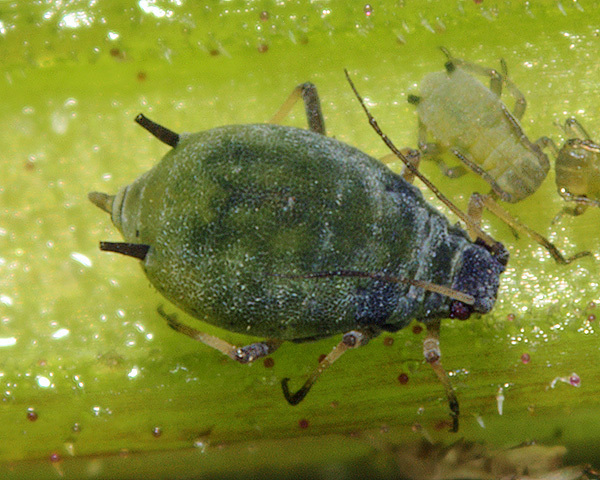 In young colonies all these aphids are concentrated under the leaves near their bases (see picture below). 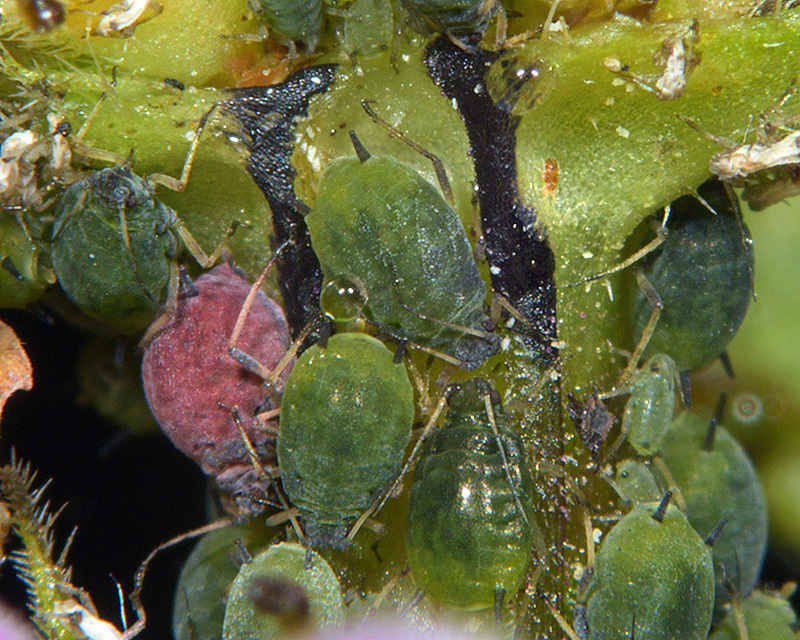 Aphis lamiorum colonies can get quite dense, with many aphids concentrated under the leaves and on the stem. 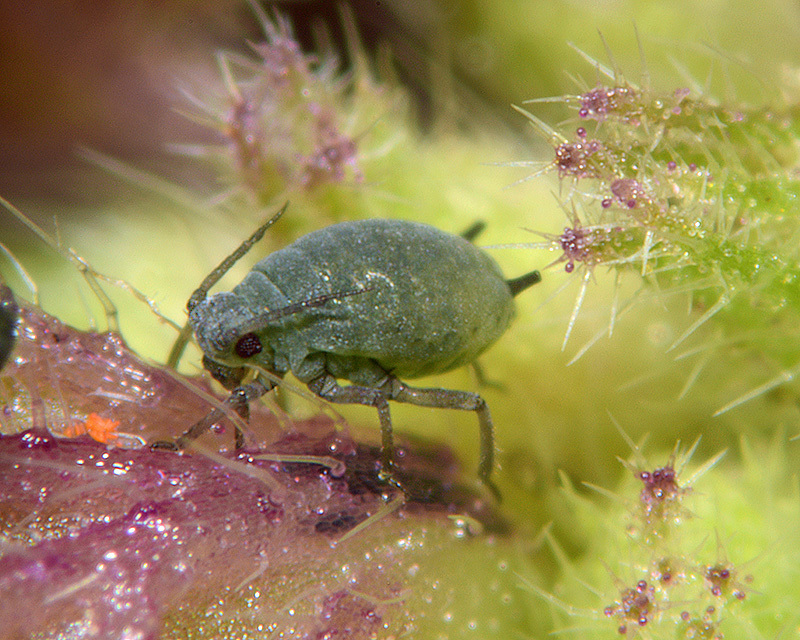 Possibly as a result of competition from adults, when populations on a plant are high, some of the youngest immature aphids can be found in amongst the flowers (see picture below of a first or second instar aphid). 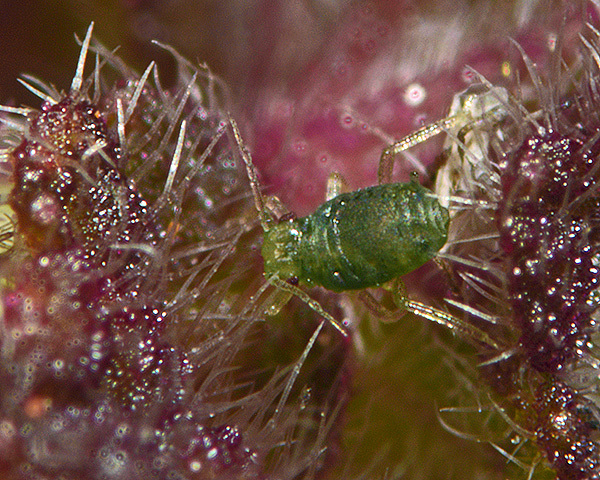 The picture below shows a third instar nymph feeding near the base of one of the flowers. 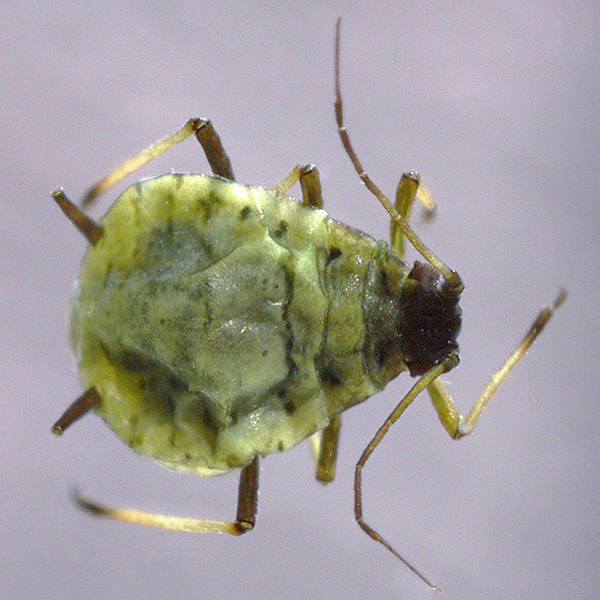 It is unusually easy to culture Aphis lamiorum, simply by keeping them on cut red dead nettle in plastic boxes - these aphids thrive even on plants cut two or three weeks earlier. 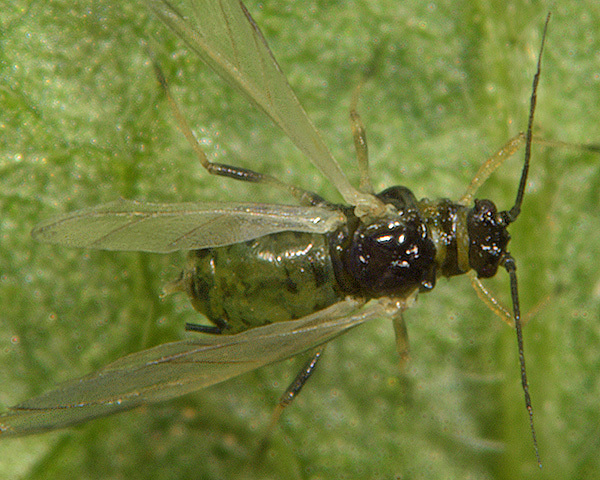 The picture below shows an adult aptera on the stem of a red dead-nettle. Alates were very rare in the field, and we have yet to find any description of the alate in the literature. They were, however, produced in our cultured populations, presumably in response to high levels of crowding (see picture below). Oviparae have been found as early as mid-August. The males are apterous. 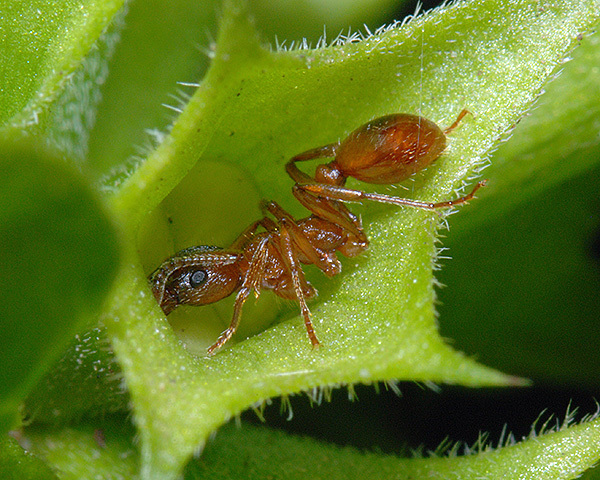 There were ants (Lasius niger agg.) on several of the plants. 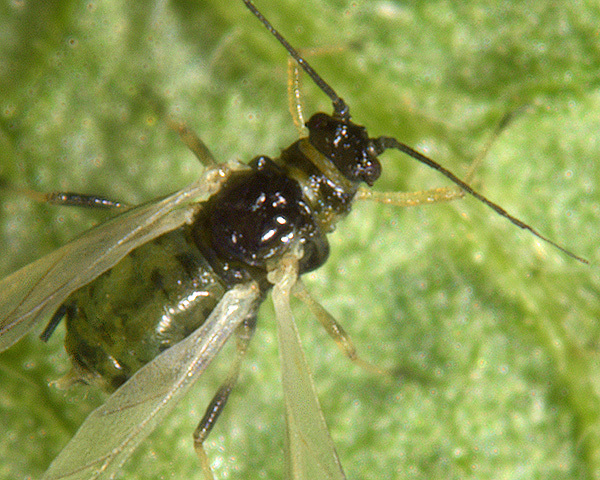 However, they were not seen to actively attend the aphid, nor did they seek to defend the aphids from interference. They may have been gleaning the copious honeydew produced by this aphid colony, but appeared to be more interested in nectar larceny from the plants (Irwin et al., 2010) - for example as shown below for a Myrmica ant taking nectar from the extra-floral nectary of a yellow archangel (Lamium galeobdolon) flower. 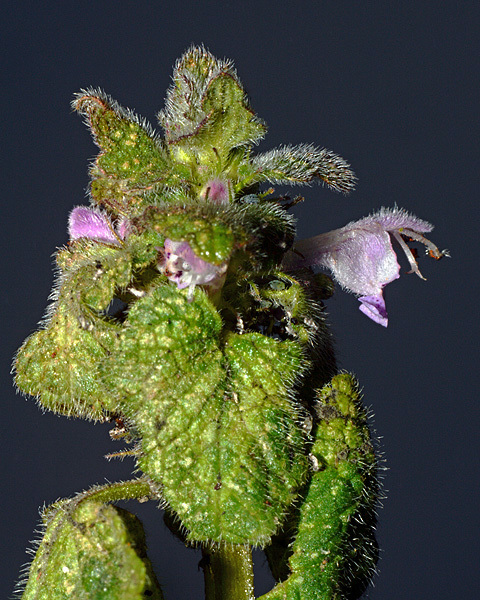 Aphis lamiorum has been recorded from 5 Lamium species, (Lamium album, Lamium amplexicaule, Lamium galeobdolon, Lamium maculatum, Lamium purpureum). 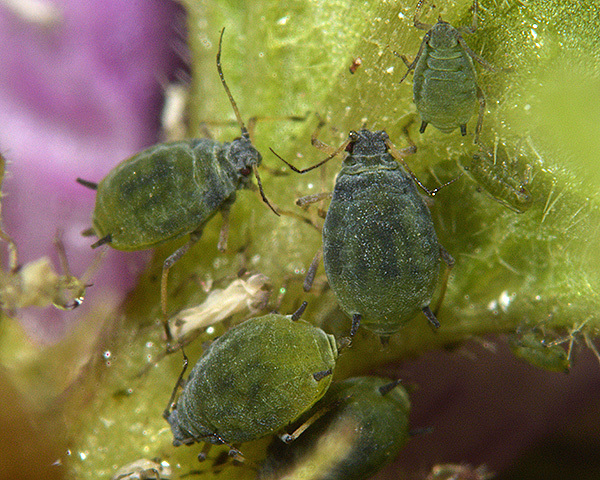 Blackman & Eastop list 28 species of aphid as feeding on dead-nettles (Lamium) worldwide, and provide formal identification keys. 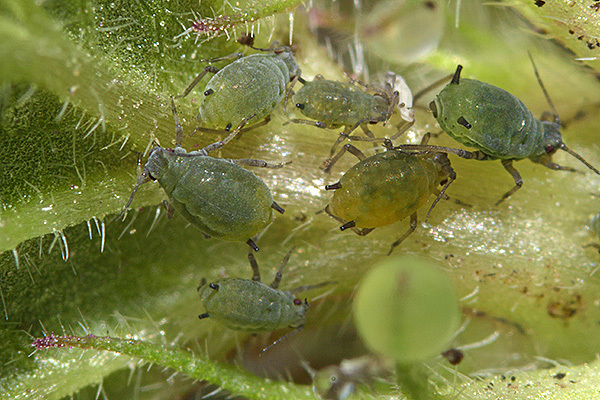 Of those aphid species, Baker (2015) lists 23 as occurring in Britain: Aphis craccivora, Aphis fabae, Aphis frangulae, Aphis frangulae beccabungae, Aphis gossypii, Aphis fabae, Aphis lamiorum, Aulacorthum solani, Cryptomyzus alboapicalis, Cryptomyzus ballotae, Cryptomyzus galeopsidis, Cryptomyzus korschelti, Cryptomyzus maudamanti, Cryptomyzus ribis, Cryptomyzus stachydis, Cryptomyzus ulmeri, Macrosiphum euphorbiae, Myzus ascalonicus, Myzus ornatus, Myzus persicae Pemphigus bursarius Rhopalosiphoninus staphyleae and Rhopalosiphoninus latysiphon. Börner, C. (1986). Neue europoäische Blattlausarten. Selbstverlag, Naumburg. Heie, (1986). The Aphidoidea (Hemiptera) of Fennoscandia and Denmark. III. E.J. Brill/Scandinavian Science Press Ltd. Leiden, Copenhagen.